A young girl’s body buried in the English countryside 1,600 years ago was a major find in 2013 because, archaeologists say, children of her age may not have been considered to have achieved full personhood because so many died so young. Many children of that time were buried in a simple burial shroud and their remains are rarely found. However, this child had been laid in a lead-lined coffin. Now new tests have also revealed the presence of the frankincense, olive oil and pistachio resin in the Roman-era grave. Whoever she was, the girl, buried in Roman Britain in Leicestershire, England, was apparently dearly loved by her family. They buried her in what would have been an extremely expensive coffin with jewelry and other precious goods. Amateur treasure hunter Chris Wright was using a metal detector in a field in Leicestershire in October 2013, when he came across the grave and alerted the authorities. Archaeologists have been conducting tests on its contents ever since. A couple of the girl’s bones and some soil samples from the casket have been sent to the University of York’s InterArchaeology Project for tests and analysis. Scientists hope to learn pre-burial treatment and mortuary practice, clothing and perishable artifacts, her diet and cause of death and possibly even drug use. 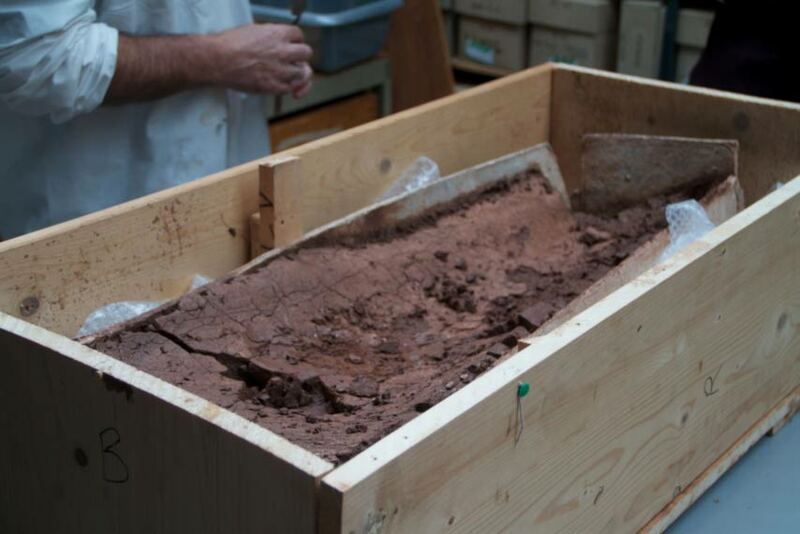 The casket was found near the site of a Roman fort in the area. A poll taken of members of the public gave the girl the Latin name Oriens. The name means “to rise” as in the sun in the East. Archaeology Warwickshire and the University of York are studying the burial site and conducted the poll. The girl apparently came from an important family close to the Roman town of Mancetter, says The Hinckley Times , an English newspaper. The coffin would have cost the family the equivalent of about £200,000. Found near the casket were several Roman nails, which are known from their square shanks. This revealed that the lead box was a lining for a wooden coffin, says Heritage and Culture Warwickshire’s website about Orien s.
Archaeologists say it’s rare to find the remains of Roman children because a high infant mortality rate meant “children may not have achieved full personhood at such a young age, a corollary of uncertain life expectancy, perhaps even due to lives being in the hands of capricious gods. Most Roman period children appear to have been placed in the ground in little more than a burial shroud.” They inferred that Oriens was from a wealthy or socially important family in the Romano-British community. This inference is supported by the body adornments found when the coffin was opened. The coffin was made by craftsmen, they concluded, because it had to be poured into a mold, which also may have been heated to keep the lead from hardening too fast, before it was all poured. There are inscribed lines or pattern marks on the lead lining of a type seen before. When they removed silt and clay from the lead box, they found two jet or slate body adornments of simple circles. It isn’t known if they were bracelets, hair retainers or bangles. Jet and shale are formed by decaying wood under extreme pressures over eons. Shale was used around 100 B.C. and early Roman era. Jet body adornments became popular later in Roman Britain from the third century on. Beachcombers collected at Whitby, North Yorkshire, where it is still available. From there, the jet was taken to York and made into fine jewelery. “Such adornments were likely to have been worn by high status individuals in Romano-British society and the fact that Oriens was buried with two of them lends further weight to the suggestion that she was from a wealthy or important Roman family,” Heritage and Culture Warwickshire says. The British Ministry of Justice will allow the body to be in Warwickshire up to 12 months. Then it must be re-interred, or the archaeologists can apply to allow further study or for display in a museum collection. It sounds like there is a lot more to this girls death that we know of just yet. I wonder if she wasn't kidnapp/murder victim or something like that. Some girl from some rich family who was murdered after her ransom paid or something like that. Interesting article. Placing a broad generalised assumption on such a complex concept as personhood is always going to throw up exceptions. It's something that causes strong debate today, after all. There's nothing to say that the very simply buried infants weren't cherished. This Romano British family seemed to have the means and desire to express it with more than usual ostentation, perhaps? I too feel this way, but note that the article says that the remains may be re-interred. Some archaeologist DO show respect when working with human remains, and are keenly aware of the "people" connected to them, people who lived, and loved or were loved. We can learn much from the study of the remains and grave goods. In some sense, the child in this instance - for whom there is no written record - lives again via that study. If she's reburied, I hope a Latin prayer, whether Pagan or Christian, will be offered for her. I cannot get over the feeling that this is desecration of the worst kind.